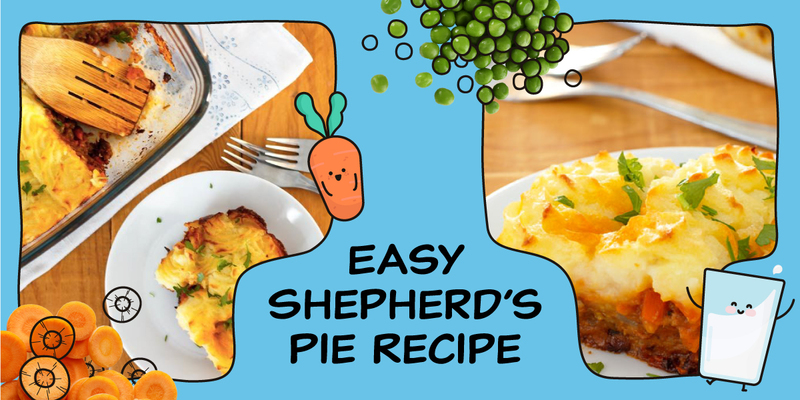 Shepherd’s Pie is easy to make and delicious! It makes for a great weeknight family meal or Sunday supper. The hearty meat stew is topped with a creamy layer of mashed potatoes. Butter and milk are your friends here in order to make those mashed potatoes extra creamy and the whole dish smooth and comforting. In a large frying pan, heat up a few tablespoons of oil. Sauté onion & carrots for 5 minutes before adding minced meat. Break up the meat and cook for about 5 minutes. Add beef stock, tomato puree, peas and Worcestershire sauce. Season with salt and black pepper. Reduce the heat to low-medium and simmer for 35 mins. Taste it. Add more seasoning, if needed. Now you can turn the heat off. While the stew is simmering, cut the potatoes into 1-inch squares and boil in a separate pot. When soft, drain and put in a bowl. Add butter and milk (we recommend warming the milk before adding it to keep the potatoes hot). Mash together with a hand masher or an electronic mixer until you reach the desired consistency. Transfer the meat mix in an oven-proof dish (and individual ramekin dishes, if using) and top with mashed potatoes. Spread evenly. You can also use a piping bag to pipe the mash over the meat to make it look fancier. Bake in a preheated oven at 200°C/400°F for 20 minutes or until the mash turns golden brown.